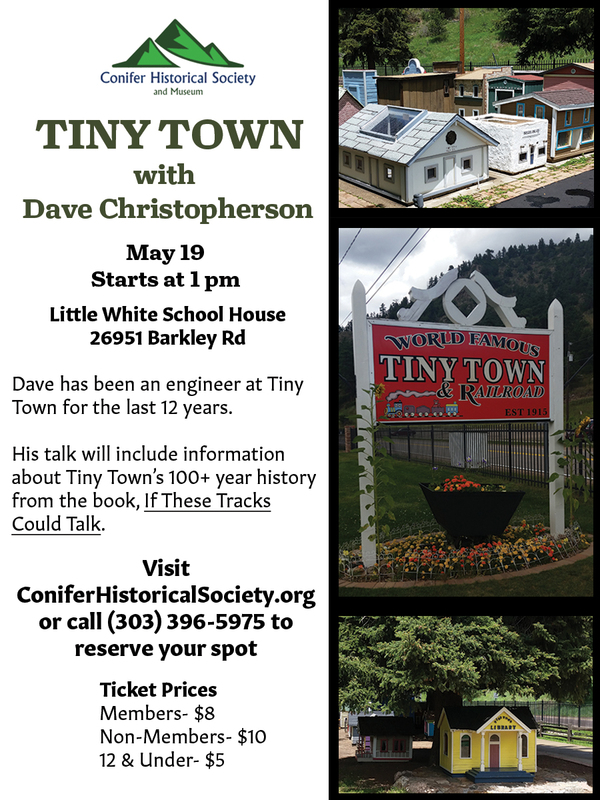 The Conifer Historical Society is pleased to present The History of Tiny Town with Dave Christopherson on Sunday, May 19, at 1:00 PM. Established in 1915, Tiny Town has become a loved destination that is visited by many families each day over the summer. Like many mountain towns in Colorado, Tiny Town has a rich history, including booms and busts. Dave has been an engineer at Tiny Town for the past 12 years. His talk will include information from the book, If These Tracks Could Talk, which details Tiny Town’s history. Purchase your tickets today at ConiferHistoricalSociety.org or call (303) 396-5975 to get more information and reserve your spot. Tickets are $8/$10 (m/n). The talk will take place at Little White Schoolhouse, 26951 Barkley Road, Conifer, CO 80433.